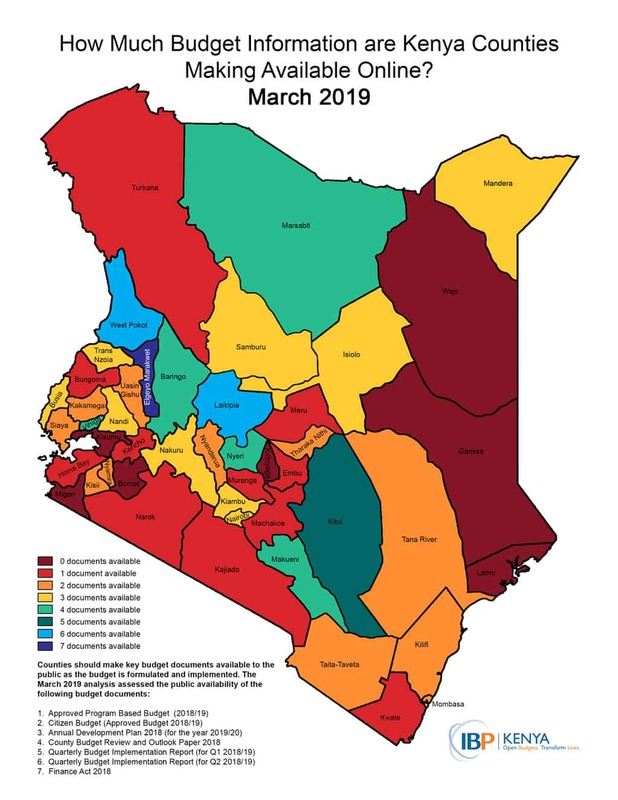 Kenya: How Much Budget Information are Counties Publishing Online? Access to timely and comprehensive information is crucial if the wider public in Kenya are to meaningfully participate in government decision making. The constitution of Kenya and the 2012 Public Finance Management Act require each of Kenya’s 47 counties to publish budget information during the formulation, approval, implementation, and audit stages of the budget cycle. This information allows the public to shape county budget priorities, discuss trade-offs with their representatives in the county assemblies, and track whether the budget is delivering on what was agreed during consultations between the public, executive, and assembly. But is the requisite county budget information being published in a timely manner? Since January 2015, IBP Kenya has been monitoring the websites of Kenya’s 47 counties to check the availability of key county budget documents that should be produced during the budget formulation stage and the budget implementation stage. Results are published twice a year.